“Though we foresee risks in rising commodity prices and exchange rate volatility in the fourth quarter, we will continue to deliver good results while remaining focused on our strategies to pursue profitable growth,” Nissan CEO Carlos Ghosn said Wednesday. TOKYO (Bloomberg) -- Nissan Motor Co., Japan's second-largest automaker, raised its profit forecast after new models and increasing sales in North America and Asia helped the company offset the impact of the strong yen. Nissan expects net income of 315 billion yen ($3.8 billion) in the year ending March 31, compared with an earlier forecast of 270 billion yen, the company said in a statement Wednesday. The automaker follows Toyota Motor Corp. and Honda Motor Co. in raising its profit outlook even as the yen trades near a 15-year high against the dollar, reducing the value of overseas earnings. The company is benefiting from new models such as the March, Micra and Juke compacts and reduced purchasing costs. Nissan expects to sell 4.165 million vehicles in the year ending March 31, up from an earlier forecast of 4.1 million. For the three months through Dec. 31, Nissan's net income rose 78 percent to 80.1 billion yen ($971.5 million) from 45 billion yen a year earlier. That was higher than the 77.3 billion yen average estimate of five analysts compiled by Bloomberg in the past 28 days. Revenue rose 5.3 percent to 2.1 trillion yen while vehicle sales gained 14 percent to 1.01 million. Nissan revised its full-year exchange-rate assumption to 85.4 yen to the dollar from an earlier forecast of 84.4 yen. Nissan, which owns about 15 percent of Renault, also benefited from its partner's improved financial performance, it said. The Japanese automaker declined to disclose Renault figures as it is yet to report earnings. Nissan's deliveries in Japan fell 21 percent in the third quarter after a government subsidy program for fuel-efficient cars ended in September. Sales gained 20 percent in China, 24 percent in the U.S. and 11 percent in Europe. Ghosn, who also heads Renault, introduced an updated March compact in Japan to boost sales. Nissan has shifted production of the model to Thailand from Japan, helping reduce the impact of the strong yen on exports to other countries in the region. Nissan also began selling its battery-powered Leaf electric car in Japan, the U.S. and some European countries in December. 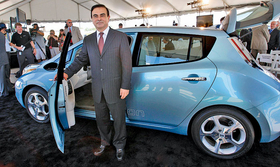 Nissan and Renault plan to have capacity to build 500,000 electric cars a year by 2012.